WEBCON, taking the next step in its global expansion strategy, is entering the North American market. Mike Fitzmaurice, the original SharePoint evangelist and often referred to as “Mister Workflow,” will be opening the Seattle office and leading WEBCON’s North American operations. Our goal is to build a strong brand presence in North America and provide the best possible support to our clients and partners in America. It’s a strategic truly exciting step for us. We’ve spent more than a decade building both a state-of-the-art product suite and a state-of-the-art business in Europe. Hundreds of clients and dozens of partners across Europe – and a few across the globe, including the United States – can already attest to the value of our low-code/no-code platform. Opening the Seattle office is a very important way to expand our presence across the Atlantic. And we couldn’t think of a better person to lead the effort than Mike Fitzmaurice, said Lukasz Wrobel, senior vice president and chief business development officer at WEBCON. Mike Fitzmaurice has over 25 years of experience in consulting, engineering, marketing, evangelism, and IT management. Having spoken at countless international conferences, hosted numerous expert sessions and webinars, he is one of the most recognizable and prolific members of the SharePoint community worldwide. Fitzmaurice spent the past decade carrying out chief evangelist and workflow subject matter expertise duties at Nintex, helping raise its profile from that of an Australian startup to an established worldwide player. He spent the previous 11 years at Microsoft, helping launch the first four releases of SharePoint and positioning it as a development platform. I’ve been watching WEBCON for years, and I’d been consistently impressed, not just by their technology, but by their business presence said Mike Fitzmaurice, WEBCON chief evangelist and VP – North America, I’d go so far as to say that, if I were designing my own product from scratch, it’d look a lot like WEBCON BPS. Most of the product-neutral advice I’ve been advocating for years? WEBCON’s been doing it. 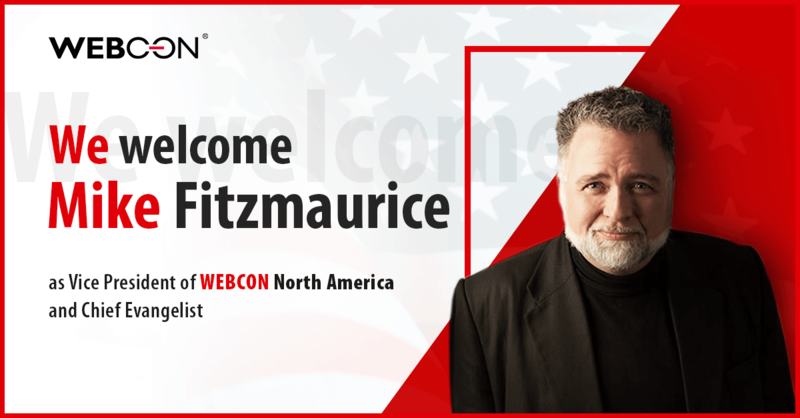 Fitzmaurice’s duties will be dual in nature; he will serve as WEBCON’s chief evangelist globally while leading business and partner channel development in the USA and Canada. Read Mike’s latest post about why he joined WEBCON. Being a European company, it was very important for us to build a strong presence and brand awareness in Europe first. While customers and partners have sought us out from across the world – including the USA – we waited until it was time before actively selling and marketing WEBCON outside Europe. Well, it’s time, said Radoslaw Putek, WEBCON president and CEO. During these past 13 years, we’ve continuously developed our platform, built a great team of specialists, and helped more than 350 international companies thrive on digital transformation by automating business processes. We’re pleased to say that our partner network and customer base have formed a community where everyone learns and succeeds. We are thrilled that Mike Fitzmaurice decided to extend not just our business, but our community, to North America. We will begin our participation in North American industry events this year at the SharePoint Conference 2019 in Las Vegas on May 21-23.